The colorful and fragrant sweet pea is a favorite in cottage gardens and other informal garden styles. It is most often seen trained up bamboo stakes or structures, but can also be left to form mounds or planted in containers where it spills over the sides. For many of us, sweet peas are an instant nostalgic reminder of the beautiful, rambunctious gardens maintained by grandparents. Sweet peas are very easy to grow, and they provide season long color provided the spent blooms are routinely removed. Sweet peas are climbing plants that bear clusters of flowers in a wide variety of colors including red, pink, blue, white and lavender. They are early summer flowers with a long season of bloom and they make excellent cut flowers. The flowers resemble fringed butterflies while their stems appear folded. Luckily, the stems are sturdy enough to hold up their profuse flowers. The old-fashioned varieties were selected for their vibrant colors and intense fragrance. Many modern cultivars are on the market offering sweet peas in almost every color except yellow, but not all of the newer sweet pea varieties are fragrant. The mature size will depend on the variety you choose to grow, but expect the vines to stretch to at least 6 to 8 feet tall. Unlike other types of this genus, sweet peas are toxic and the seeds should not be ingested by humans or pets. Sweet pea (Latin name Lathyrus odoratus), is a climbing annual member of the legume genus. 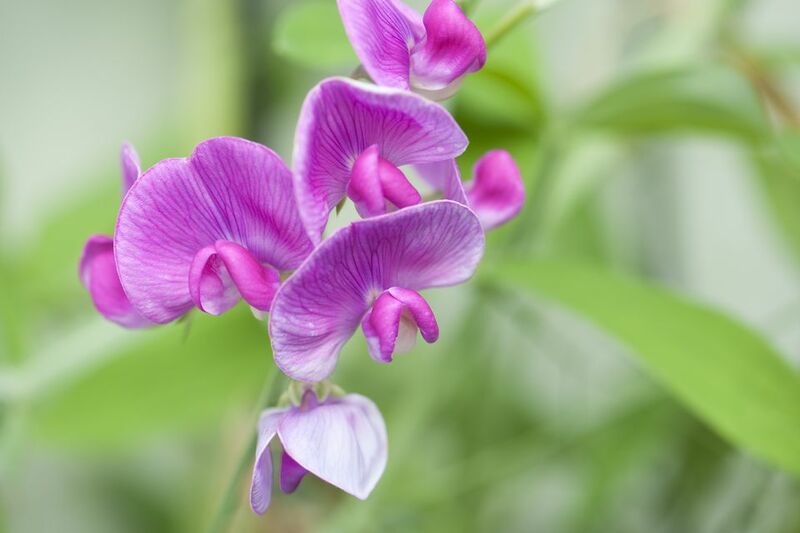 Originating in the southwest Italy and the islands of the Mediterranean, sweet pea has been cultivated for use in gardens since the 17th century, but reached its modern forms under the work of Scottish nurseryman Henry Eckford, who developed dozens of cultivars in the late 1800s. Sweet peas lend a cottage feel to gardens. They are often grown on bamboo tripods, but they will gladly grow through shrubby plants, much in the same way that clematis is sometimes used. Sweet peas also work well in a vegetable garden, attracting bees and other pollinators needed in the vegetable garden. They can be grown along the fence or mixed in with the pole beans. Sweet peas can also be left to grow in a clumping mound that will achieve a height of about 2 1/2 feet. As annuals, sweet peas can be grown in all USDA hardiness zones, though they do best in climates with relatively cool summers. They thrive in full sun, although in warmer climates they do well in a location that receives partial sun, especially in the heat of the afternoon. In the South, you may have better luck seeding sweet peas in the fall to grow into winter. Sweet peas prefer rich but well-drained soil. A soil pH that is slightly alkaline (about 7.5) is ideal for sweet peas. Sweet peas are usually direct sown. To assist germination, seeds should be scarified by nicking and/or soaking in water for several hours to soften the seed coating. Seed can be started outdoors, as soon as the ground has warmed to about 50 degrees F. and is not too wet. You can get a jump start on the season by starting seed indoors, about 4 to 5 weeks before your last frost date. They will be easier to transplant if you start them in peat. When you are ready to transplant, pinch any flowers or buds off that may have formed, which will encourage root development. They like cool soil, so a thick layer of mulch around the plants may help sweet peas thrive. When the plants reach about 3 to 6 inches tall in the garden, pinch the seedlings to encourage strong side shoots. Sweet pea vines have tendrils and will attach themselves to most any type of support that has meshing or strings. During the growing season, sweet peas require steady, regular feeding and watering. Feed them monthly with a fertilizer high in potassium, such as a tomato fertilizer. Adding a bit of blood meal to the soil is thought to help keep the stems long and suitable for cutting. Most sweet pea varieties will begin blooming in late spring or early summer. The more you cut the flowers, the most blooms you should get, so don't hesitate to bring some bouquets indoors. Deadhead the spent flowers to encourage continued blooming. Avoid planting sweet peas in the same location year after year. There are many wonderful sweet pea varieties available as seed. You can packet of individual colors or with a blend of colors. Remember that not all sweet peas are fragrant, so be sure to check the package. 'Old fashioned': Although not really a variety, sweet peas labeled old fashioned should be very fragrant. Spencer cultivars: these are especially hardy vines with striking coloring, but not all of them are particularly fragrant. Bijou Group: This is a sweetly scented dwarf variety suitable for containers. There are few pests or problems associated with sweet peas, however groundhogs and rabbits will eat the seedlings, so protecting them with a spray repellent is a good idea when they are first in the ground. Few insects bother sweet peas, but the plants may be done in if temperatures get too hot.